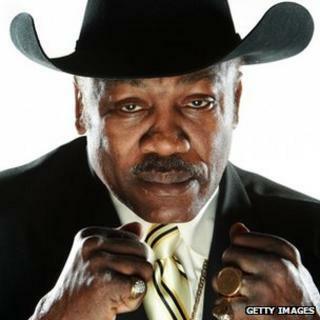 Former world heavyweight boxing champion Joe Frazier is in hospice care with liver cancer, his manager says. He says Frazier - also known as Smokin' Joe - was diagnosed with cancer several weeks ago. "I would be a liar if I did not tell you it is very serious," Leslie Wolf told Reuters news agency. The 67-year-old held the world title between 1970 and 1973. He was the first man to beat Muhammad Ali in 1971. He lost the next two bouts with Ali. Mr Wolf said that Frazier was diagnosed with liver cancer last month and was now in hospice care in Philadelphia. "Joe is a fighter. Joe doesn't give up," the manager said, adding that doctors and Frazier's team were "doing everything we can". Frazier won the heavyweight title in 1970 by defeating Jimmy Ellis in New York. He held it until 1973, when he was beaten by George Foreman. But the boxer is perhaps most widely-known for three great fights with Ali, including the epic Thriller in Manila in 1975.